Heavy rains coupled with lack of road networks have made large swaths of South Sudan inaccessible. So we are forced to airlift food, a costly necessity to curb the looming food crisis that threatens to take more lives than the Somali famine of 2011. 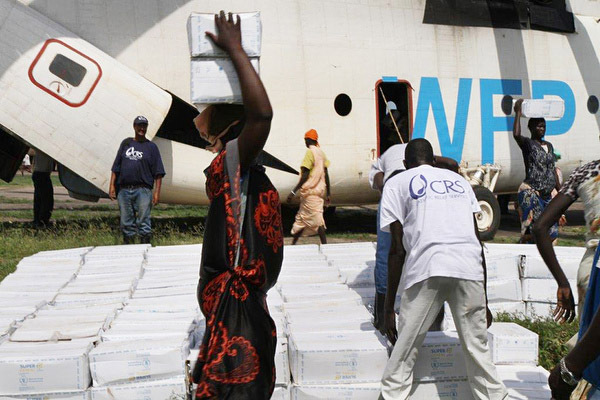 Catholic Relief Services has teamed up with the World Food Program (WFP) to airlift 7,000 metric tons of food to feed more than 100,000 people in Jonglei State over the next few months. The crisis and the violence that have wracked this country have impacted everyone. 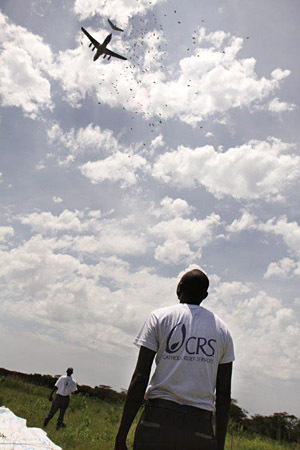 The majority of CRS staff on the ground implementing the food distributions have been themselves displaced. Some have had their homes destroyed and possessions looted or lost, their families scattered. At great personal risk they walk for days, sometimes wading through knee-deep water, to reach food distribution points. That’s because when the conflict erupted in South Sudan, people sought safety in remote hard-to-reach areas. They penetrated deep into the bush in order to protect their families from further losses and death. So the airdrops are taking place in the middle of nowhere. The CRS team has to get to these places and then clear a large area of land with hand tools so that the food can be dropped from cargo planes. They also have to create a temporary space for helicopters to land and offload items like oil and corn soy blend that are too fragile to drop. This is not just about dropping food, and people picking it up and running away. Every sack and every tin has to be accounted for and reported and properly distributed. Our team organizes this, keeping records for as many as 14,000 people who get food at any one time. Keep in mind there is nothing there waiting for the team when they arrive at the distribution. They must carry everything with them and live in the bush for up to 3 weeks at a time. This is demanding work in a very difficult environment. There are no health facilities, but there are snakes and thousands of mosquitoes as we’re at the peak of the malaria season. Because of the ongoing insecurity and the distrust that arises from violent conflict, the success of these distributions relies heavily on our local staff, the people who live in Jonglei State. Our staff needs to contact and be accepted by the local authorities. Strangers wouldn’t go into these communities because they wouldn’t feel safe. The staff need to be able to speak the local language and have ties within communities. A food distribution has to be well planned. Areas need to be designated for the food drops and distribution points. The community itself needs to help prepare the land for the distribution to take place. All of this requires skillful negotiation, and knowledge of the culture and communities. Not just anyone can go in and do this. It is a delicate process. Fortunately, CRS had more than 400 local staff on our roster before the crisis started. This provides us with a unique network to call on and orchestrate these distributions from the ground level. The airdrops are vital but not sustainable. We need to continue to look for more locally appropriate opportunities for people to help themselves. Once the rainy season is over, if there is no further fighting, CRS can move into remote areas to provide more assistance such as seeds and tools so people can get their own crops in the ground. But we are not sure what we will find when remote areas become more accessible during the dry season. If there has been no harvest because the fear of violence has resulted in little or no planting, hunger can become acute as stocks of wild foods are depleted and fishing waters dry up. So it is critical during the dry season to focus on continuing long-term agriculture development work so that eventually people can resume providing for themselves. There is no doubt that these communities want to help themselves. People don’t want handouts, but many do need a small amount of resources to resume their agricultural livelihoods. They also don’t want this fighting. This is not a civilian war. They don’t want their kids conscripted to fight for any of the combatant forces. Though many depict this conflict as being along ethnic and tribal lines, we’re hearing increasing reports that the communities themselves are trying to repair broken relationships and find ways of living alongside each other again. That’s when food will no longer be dropped from the air, as it will once again be grown from the ground. Brigid O’Connor of Catholic Relief Services is chief of party for the USAID-funded Jonglei Food Security Program. She is based in Bor, South Sudan.